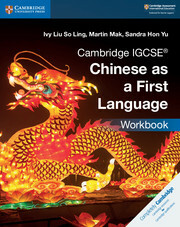 Take an active approach to first language Chinese with activities that reinforce language learning and expand vocabulary and idioms. This Cambridge Elevate edition focuses on building students’ reading and writing skills through real Mandarin Chinese texts about different topics, such as Chinese philosophers and sport. It also provides opportunities to develop essential life skills including creative thinking, communication and problem solving. 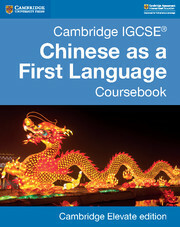 At the end of the course, students should be able to critically analyse literary work written in Chinese and demonstrate a strong writing ability. Suggested answers to the questions in this digital resource are in the teacher’s book. To give students a taste of authenticity, this coursebook is based on real-life contexts with extracts from newspapers, magazines, online materials and other publications from Mandarin Chinese-speaking communities. Eight topics – including Chinese philosophers, historical figures and social relationships – immerse students in Chinese culture and language. Exam-style questions and clearly stated learning objectives promote self-assessment and independent study.